When you live in your vehicle, full time or part time, you have to get used to a lot of new things - like peeing in the woods in the middle of the night, spending your time in auto parts stores, and people endlessly quoting the Livin’ in a Van Down By The River sketch. 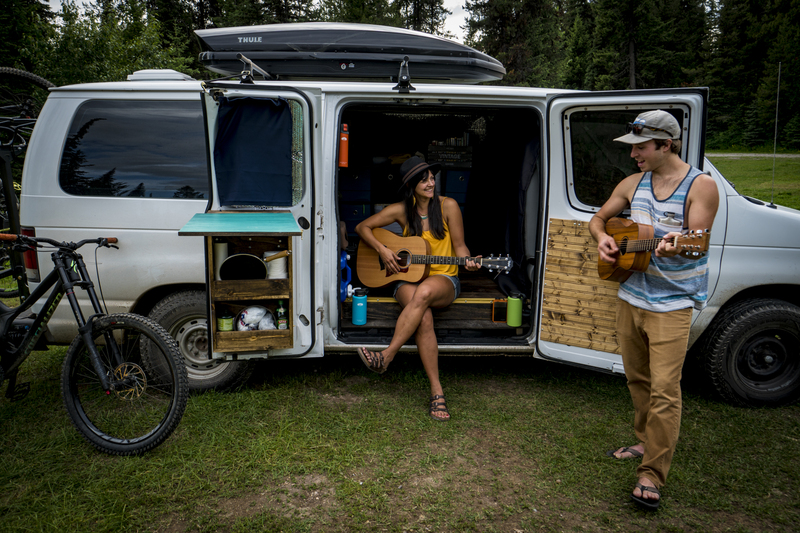 Vanlifing is all about saving space and getting by without the amenities we take for granted (like frequent showers, microwaves, or couches. Whether you’re heading out on a year-long vanlife road trip or just like to spend some weekends sleeping in the back of your truck, this is the cooking gear to get you started. The most important element in every adventure? Food. You need a cookset that can do it all without wasting your precious square footage. We can’t say much about your driving partner, but the Bugaboo Base Camper is compact, efficient, and will never let you down. The Medium Base Camper comes with both a 2 and 3 liter pot (both with strainer lids), 8 inch frypan, cutting board, folding pot gripper, and stuff sack for the whole set. This cookset can handle the most elaborate meals (but if you’re eating boxed mac and cheese for the third day in a row, it can handle that too). Once you’ve got the cooking down, you need something to eat off of. No need for fancy ceramics or a family sized set of spoons - living in your car is about simplicity. This Infinity Tableset has all you need and nothing else: a fork, knife, spoon, plate, cup, insulated mug and lid, bowl with lid, and stuff sack. Invest in two sets if you’re the type to let your dirty dishes “soak” for a while instead of washing them right away (you know who you are). Living in a vehicle means you don’t have access to running water (or at least the kind of running water that comes from pipes). This collapsible, durable water container with integrated handle and easy pour tap means you can fill up from whatever source you find and get out of town. Use this cube to fill your water bottles, wash dishes, fill dog bowls, and oh yeah - brush your teeth. It’s a life of glamour out there, folks. The second most important liquid. Driving across the country and sleeping inside a large box of metal takes a lot of determination, patience, and caffeine. But ask any office manager - nothing takes up more space than a coffee pot, French press, and assorted coffee mugs scattered around. Consolidate your caffeination with the Commuter Javapress: coffee maker and mug in one. Brew, sip, hit the road. Last but not least, you need silverware. Specifically, you need a spoon, a fork, and a knife. Lucky for you, we make a set with all three. Convenient, huh? Easy to wash, store, and use, this Stainless Steel Cutlery Set will save you from flimsy drive thru plastic forks and having to try to eat your spaghetti with a spoon. Food is incredibly important when you head out on the road - just like your car needs gas (or diesel), you need fuel to keep your stomach happy on the road. Armed with these tools, you're ready to hit the pavement (or dirt, or gravel).